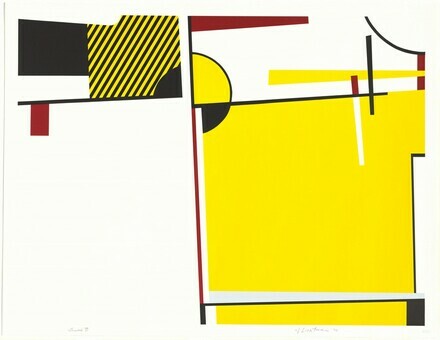 The Prints of Roy Lichtenstein, National Gallery of Art, Washington; Los Angeles County Museum of Art; Dallas Museum of Art; Parrish Art Museum, Southhampton, NY, 1994-1995, 130, no. 121. The Prints of Roy Lichtenstein, National Gallery of Art, Washington; Los Angeles County Museum of Art; Dallas Museum of Art; The Parrish Art Museum, Southampton, 1994-1995, no. 53. Gemini G.E.L. Sequence List. Los Angeles, California: Gemini G.E.L., unpublished, no. 471. Fine, Ruth E. Gemini G.E.L. : Art and Collaboration. Washington, DC: National Gallery of Art, 1984, no. 87. Corlett, Mary Lee and Ruth E. Fine. The Prints of Roy Lichtenstein: A Catalogue Raisonné 1948-1993. New York and Washington: Hudson Hills Press in association with the National Gallery of Art, 1994, no. 121.